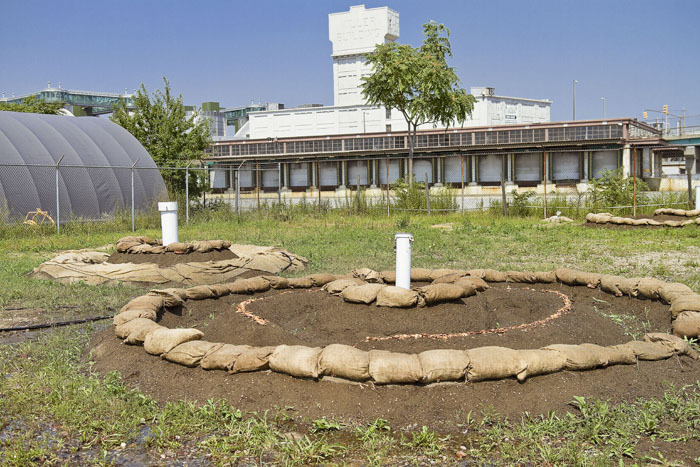 The Fairy Rings @ ExxonMobil Greenpoint Petroleum Remediation Project Site is a land art installation and social sculpture that imagines the future by working together to find solutions. The site at 400 Kingsland Avenue in Brooklyn, New York becomes the stage for this investigation. Looking at the dynamic relationships of how large corporations, community groups, and a Superfund site navigates using art and science to incite imagination and faith to create a story of our collective present and future. Teaming up Jason Sinopoli, a local resident and long time advocate of mycoremediation, the project borrows and adapts methods from the authority of mycoremediation and mycologist expert, Paul Stamets. Mycoremediation uses fungi to break down long-chained toxins into simpler less toxic chemicals at the molecular level in polluted environments. Recognizing that the land on the site has already been capped of pollutants and will not be publicly accessible, the installation becomes a relationship of trust/cooperation and the mycoremediation acts as a metaphor of how technology, nature, and humans can transform, adapt, and innovate. In European folklore, it was believed that the gathering and dancing of fairies and elves created fairy rings, a circular discoloration or growth of mushrooms on a grass lawn. The belief transformed these spaces from reality into fantasy. Today, we now know fairy rings are a natural phenomenon created by fungi. The Fairy Rings will encourage the interaction of reality and fantasy by the growth of these rings. The installation is located at the northeastern corner of the property around ground water monitoring wells used to monitor the progress of the cleanup of the oil plume caused by over 100 years of operations by the oil and gas industry in Greenpoint, and which went undetected until 1978. Nine circles of a mushroom mycelium mound created 5-19 feet in diameter wraps around four monitoring well with an maze like entrance that points the viewer to locate them in the environment from: the Manhattan skyline, Newtown Creek, Long Island City, and the remaining oil tankers in the distance. For The Fairy Rings, the oyster mushrooms, Pleurotus djamor complex and Pleurotus osteatus, – mixed with straw and enclosed in burlap bags- is used as a substitute to the other species known to create fairy rings naturally. 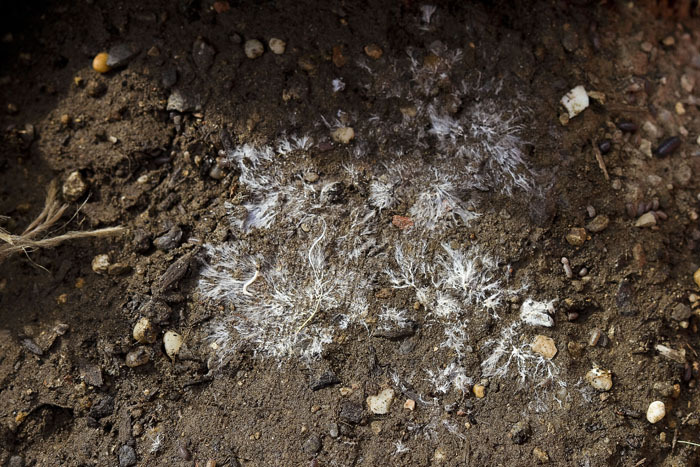 In The Fairy Rings mycoremediation methods are referenced using fungi to decompose the pollutants and shape a new ecology. Oyster mushrooms are especially apt at two major functions: to neutralize hydrocarbons present in petroleum products such as oil, pesticides and herbicides and as a hyperacummulator to absorb heavy metals, especially mercury, these are common toxins often found in landfills and urban environments. The sculptural form is an alliance between the material structure and nature. Nature participates through the ongoing process of sprouting mushrooms, mycelium decomposing and holding the potential of cleansing the land of toxins for the next era. In our increasingly mediated world, as the majority of people on the planet now live in urban environments, our relationship with nature has evolved through the use of technology to bridge the disconnection. The Fairy Rings reference the innovations being made in biological technology to recapture our connection to nature. 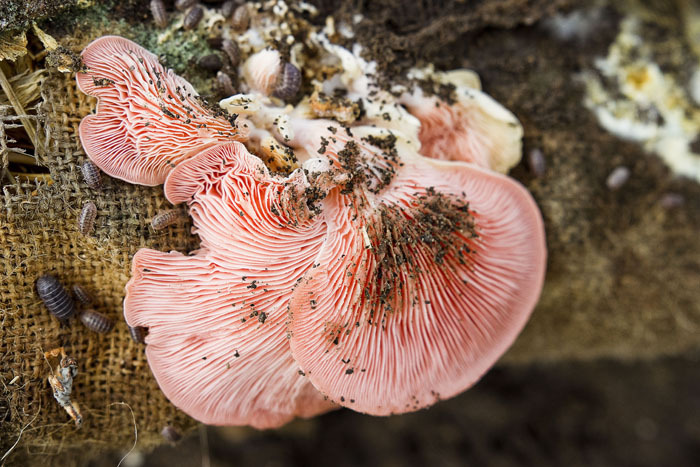 Fungi functions as a mediator in the ecological circuit: fungi, animals/insects, bacteria, plants, animals/insects, and fungi. With The Fairy Rings, another role for fungi is to act as the interface to help us visualize a better symbiotic relationship between humans/nature and large corporations/community groups to work together. In collaboration with Newtown Creek Alliance and ExxonMobil.